LWRCI is a true leader in the firearms industry, and the IC-A5 SBR, built for the Secret Service, only continues that reputation. The author mounted the foliage green test IC-A5 SBR upper on an older IC-PSD lower with a Patriot Brown Cerakote finish. 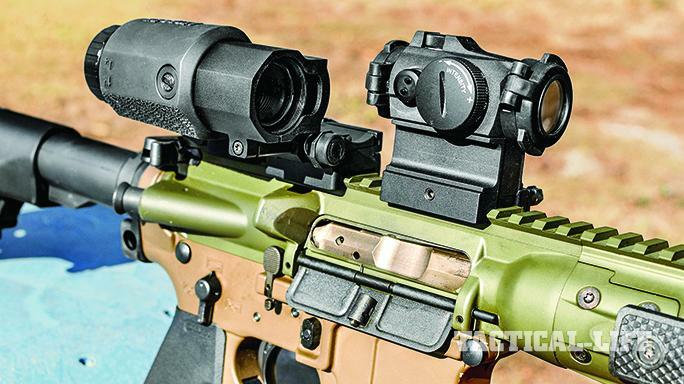 Aside from LWRCI’s Skirmish backup sights, the author added a SureFire light and FA556K suppressor as well as Aimpoint’s Micro H-2 and 3X-C magnifier. 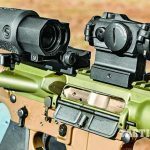 LWRCI’s flip-up Skirmish rear sight offers four different apertures for accurate shots at various distances. 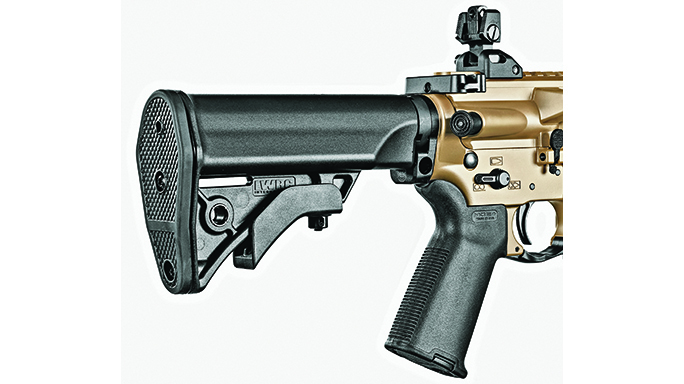 LWRCI’s IC rifles are designed to be fully amibidextrous. 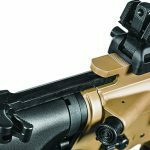 Even the charging handle is designed for right- and left-handed users. The IC-A5 SBR comes standard with LWRCI’s enhanced fire control group, though the “full-auto” selector position is just for show. The United States Secret Service protects the sitting president and his or her immediate family, along with all former presidents and their spouses. They are unquestionably the most photographed security detail in the world. The men and women who work on a detail represent the last line of defense for the protectee. What is not often seen are the outer rings of protection that stay largely in the shadows. These rings include but are not limited to the Counter Assault Team (CAT), Protective Intelligence agents and the Counter Surveillance Unit. Most agencies and details will not openly discuss the methods or equipment used in their duties. However, from time to time, the public gets a glimpse behind the curtain. One such case was the assassination attempt on President Reagan in 1981. Seconds after the shots were fired, a Secret Service agent produced an Uzi submachine gun from a briefcase. The Service later transitioned to Heckler & Koch MP5s, which have been observed on several occasions. 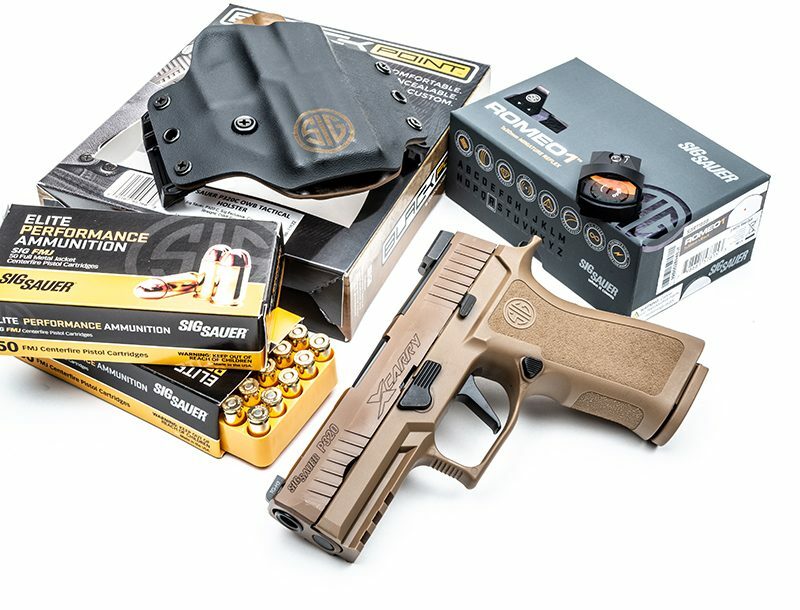 In recent years, the changing threat matrix has resulted in many agencies transitioning from 9mm submachine guns to comparably sized platforms chambered for a rifle cartridge. Today’s threats, along with an aging fleet of long guns, has had an impact on the Secret Service. In March of 2016, the Secret Service released a solicitation for a new rifle. 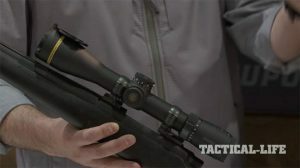 The basic specifications stated that the rifle could be no heavier than 7.5 pounds and no taller than 8.5 inches without accessories. It had to be chambered in 5.56mm NATO and utilize a 1-in-7-inch-twist barrel 10 to 12 inches long with a minimum service life of 20,000 rounds. The rifle could use the direct-impingement system or a short-stroke gas piston, but the fire control selector had to be ambidextrous. The rifle had to offer semi- and full-auto firing modes, but no burst-fire capability. 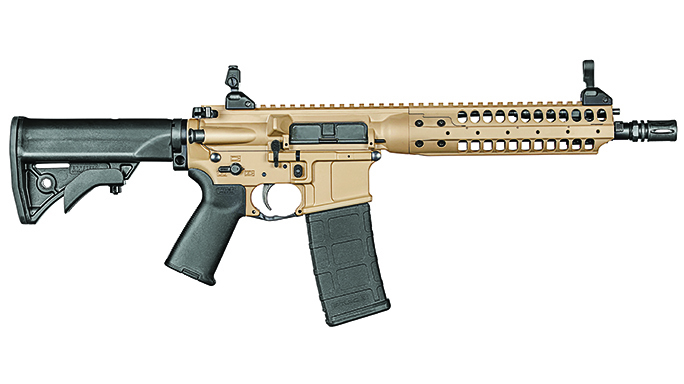 LWRC International was one of many companies to submit a rifle for the evaluation. 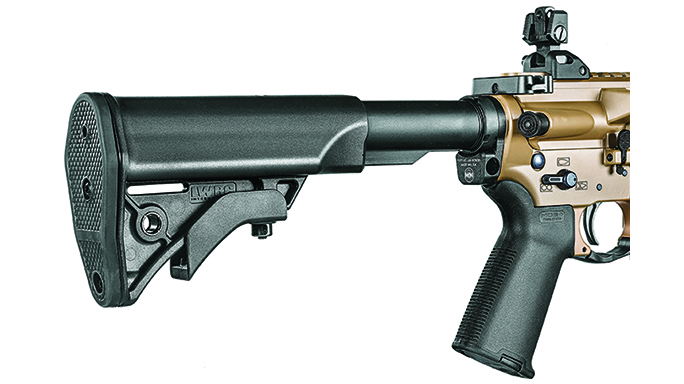 Its submission was based on the carbine that the company had developed for the U.S. Army’s Individual Carbine (IC) program. The goal of the IC program was to improve the design, durability and operating controls of the legacy M16 platform. The Secret Service solicitation contained many of the same requirements. 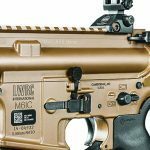 LWRCI’s IC series rifles feature fully ambidextrous lower receivers that are ergonomically compatible for both right- and left-handed operation. The safety selector, magazine release and bolt release levers are on both sides of the receiver. 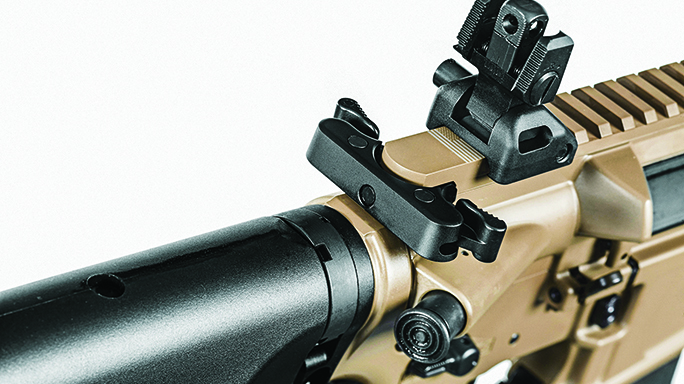 The bolt catch, on the right side, is located to the rear of the magazine release button. This position allows it to be manipulated by the trigger finger of a right-handed shooter. The left-side magazine release consists of a large paddle that is recessed and protected by two raised ribs that prevent any accidental release. The magazine release can be manipulated by the thumb or trigger finger of either a right- or left-handed shooter. 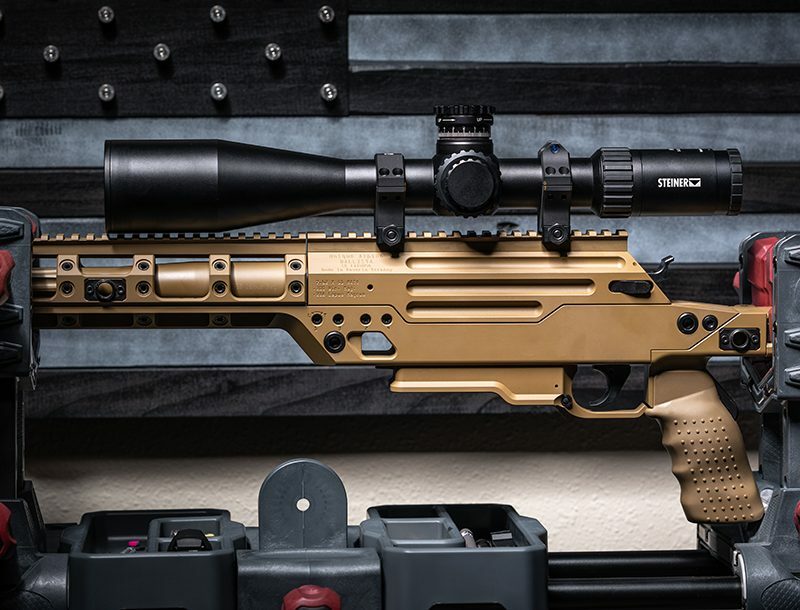 The IC platform also uses a Monoforge upper receiver with a built-in, low-profile handguard that shooters can configure by attaching Picatinny rails for accessories where needed. Both the upper and lower receivers are forged and then struck twice, once before and once after being heat-treated. This processing is known in the industry as “coining,” and it allows LWRCI to maintain extremely tight tolerances. The lower features a flared magazine well for faster reloads and a magazine stop to eliminate over-insertion of the magazine. 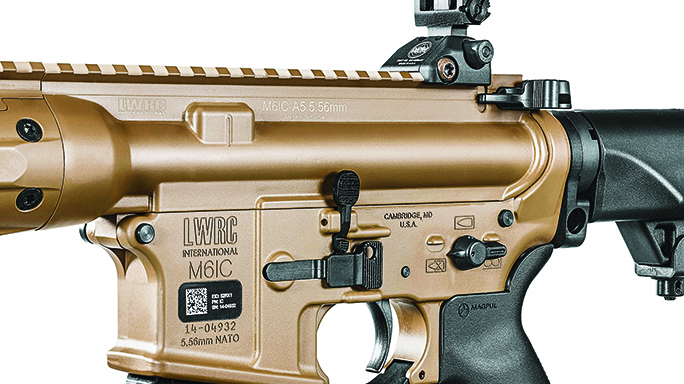 All IC rifles also feature LWRCI’s large, ambidextrous charging handle. LWRCI is known for its ultra-reliable, patented, self-regulating, short-stroke gas piston operating system. This design ensures gas and carbon do not build up in the receiver and bolt carrier group for enhanced reliability, and it helps reduce recoil and muzzle rise. 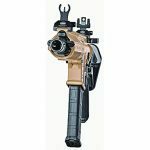 Yet even with the gas piston system, the LWRCI rifles retain substantial parts commonality with traditional direct-impingement rifles. The piston is accessed by loosening two retaining screws and removing the top portion of the rail assembly. The design captures the retaining screws and allows for easy maintenance in the field. LWRCI barrels are forged from oversized 41V45 steel alloy barrel blanks using high-pressure rotary hammers. This process results in near-perfect rifling that is molecularly stronger than other forms of rifling. The barrels are also treated with NiCorr, which is “more lubricious, harder wearing, and more heat and corrosion resistant than normal hard chrome.” The company advertises that its barrels can withstand 20,000 rounds as compared to a standard mil-spec barrel’s 6,000- to 10,000-round lifespan. All LWRCI bolt carriers are coated with nickel-boron for increased resistance to corrosion and wear. The coating also provides a permanent lubricity and enhances reliability under harsh conditions. 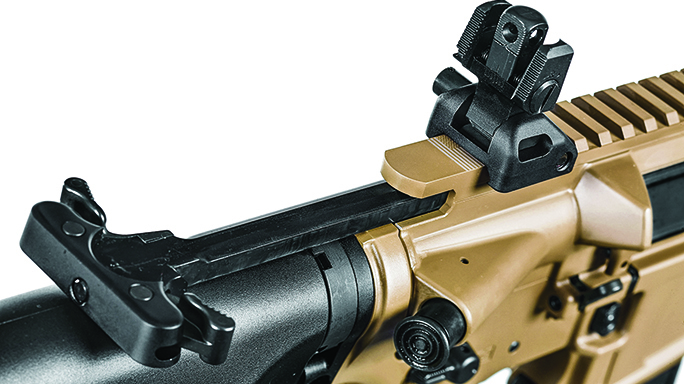 The IC rifles are equipped with LWRCI’s Skirmish backup iron sights. 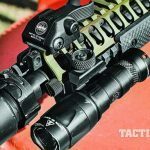 The rear sight offers four different aperture diameters. 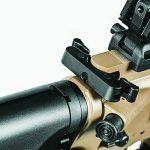 The front sight consists of a post that is adjustable for elevation and features a semi-circular guard that is reminiscent of the sights found on an MP5. In my opinion, the LWRCI backup sights are the best on the market today. LWRCI offers Cerakote finishes as a factory option to the standard black anodizing. When Cerakote is applied over the top of the standard Type 3 hardcoat anodizing, it provides exceptional resistance to both abrasion and corrosion. Cerakote also has self-lubricating properties that enhance reliability, especially in dry and duty environments. Currently, the company offers Cerakote in Flat Dark Earth, OD green and bronze. LWRCI submitted its IC-A5 SBR for the Secret Service evaluation. 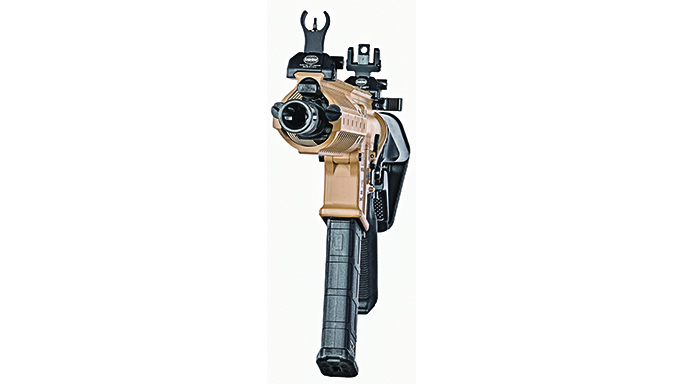 The IC-A5 SBR features a 10.5-inch barrel with a two-position-adjustable gas block. This low-profile gas block provides increased reliability and reduced wear when using a sound suppressor. LWRCI sent me a 10.5-inch-barreled IC-A5 upper for testing that I installed on my older IC-PSD lower, providing me with the same configuration as the carbine submitted to the Secret Service. My rifle had an upgraded Geissele SSA trigger, and I had exchanged the Magpul MOE grip for an MOE-K grip. Having shot the 7-inch-barreld IC-PSD for several years, I was pleasantly surprised at how the IC-A5 SBR handled. The additional 3.5 inches in barrel length balanced out the rifle for better tracking and target transitions. I removed the A2-style birdcage flash suppressor and replaced it with a SureFire FA556-212A flash suppressor/adapter in order to run my FA556K suppressor. The adaptor added approximately 0.5 inches to the overall length. To obtain the best accuracy results, I installed a Leupold 2.5-8x36mm Mark 4 scope with a LaRue SPR mount. The scope’s TMR reticle and brilliant light-gathering capabilities make it a great option for sportsmen and operators alike. It’s become my “go-to” glass for any AR-platform evaluation. 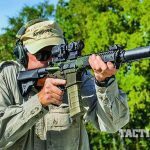 I used three loads to test the IC-A5 SBR at 100 yards: Hornady’s 55-grain TAP Urban and 62-grain TAP Barrier ammunition as well as Aguila’s 62-grain FMJs. The 55-grain TAP Urban load averaged 2,367 fps while the 62-grain TAP Barrier load averaged 2,501 fps. (By comparison, when I evaluated the 7-inch-barreled IC-PSD, the 55-grain TAP Urban ammo averaged 2,263 fps.) The Aguila 62-grain FMJs averaged 2,482 fps. 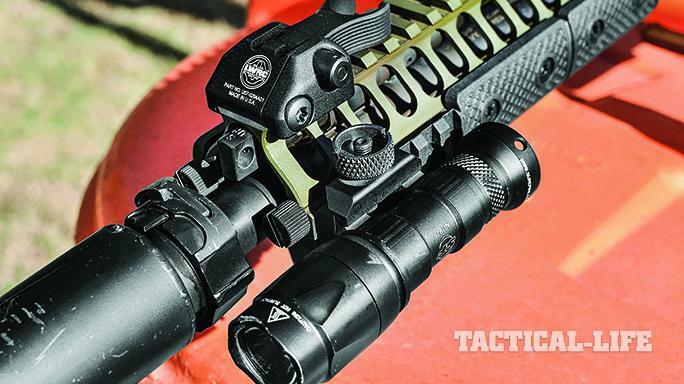 At 100 yards, the little IC-A5 SBR proved to be exceptionally accurate with all three loads. 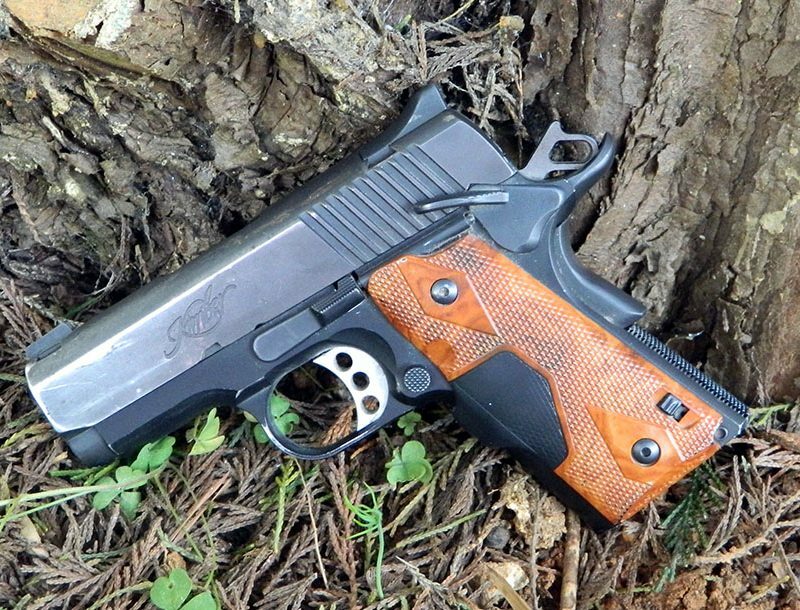 The 55-grain TAP Urban load produced a group that measured 0.8 inches while the 62-grain TAP Barrier’s best five-shot group measured 0.95 inches. The group produced by the Aguila FMJ round measured 1.2 inches. 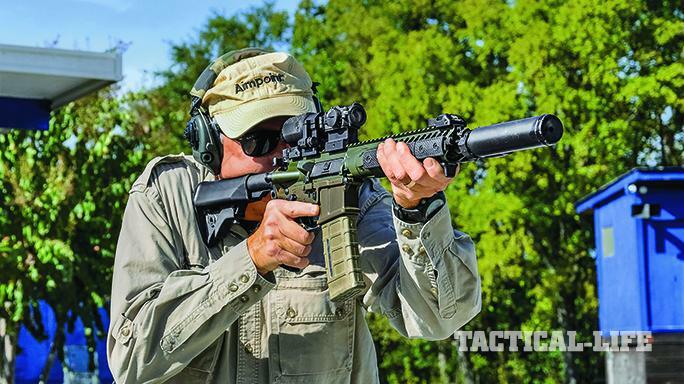 I shot all of the groups with the SureFire FA556K suppressor installed, and the adjustable gas block ensured that the IC-A5 SBR was 100-percent reliable. I then removed the Leupold scope and replaced it with an Aimpoint Micro H-2 red-dot sight and a 3X-C magnifier. The H-2 features a 2-MOA dot, and its advanced circuitry and power management allows up to 50,000 hours of continuous use on a single 3-volt CR2032 lithium battery. With the Micro H-2 and 3X-C, I was able to consistently hit 8-inch plates out to 300 yards. At 50 yards, I was able to shoot several sub-1-inch groups. 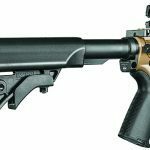 Even with the sound suppressor installed, the 10.5-inch-barreled carbine was compact, well balanced and easy to transition between targets. When it came to transporting the IC-A5 SBR, I relied on my BlackHawk Diversion Racquet Rifle Case, which is patterned after a standard racquet bag and constructed from nylon with padded walls and an inner divider. The case is 29 inches long externally and 27.5 inches long internally. Its tapered shape and blue and white color complete the camouflage. 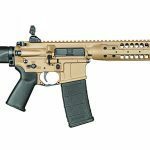 In the end, the IC-A5 SBR is a highly refined PDW that is well suited to any operation or mission requiring a compact, 100-percent-reliable suppressed rifle. Like the military and other government agencies, the Secret Service does not comment on ongoing evaluations. However, I recently learned that the Georgia State Patrol has adopted the similar M6-G carbine for use and taken delivery of approximately 1,000 units. The road troopers are equipped with 14.7-inch-barreled guns while the GSP SWAT team purchased 10.5-inch-barreled guns. In addition, they purchased a number of 7.62mm NATO REPRs. 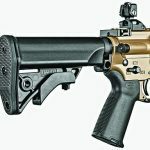 LWRCI is a true leader in the firearms industry, and the IC-A5 SBR only continues that reputation.